I recently attended a two-day summit for Yahoo Merchant Solution store owners, that’s the platform we use to host our CFSBinds.com ecommerce store. I went there strictly to get tips on how to make our store better for our customers and to find ways to improve our search engine rankings – I had no intentions of making any purchases. Like many seminars, there was a vendor showcase pavilion where attendees could look at offerings from vendors. I’d heard about a developer firm who could provide an account registration system for our store, something many of our customers have asked for. So I went to ask them about it and see what I could take back to the office. Now being a trained graphic designer, I tend to be a bit critical when looking at promotional materials – their catalog of services was not only deigned well, the binding was well done and very professional looking. It helped to assure us that they not only cared about informing their customers, it also showed they care about how they are perceived. Okay, so long story short, we ended up making a sizable investment in the registration system from them (more exciting news to come on that in a future post)! Making a statement and having a professional look when it comes to your bound documents can help to push an average booklet toward one that makes an impact and achieves your goal. 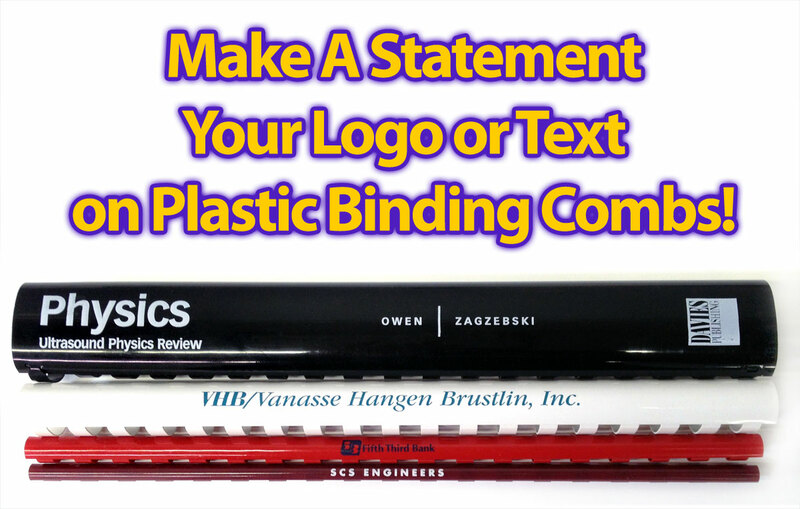 There’s no doubt that we have to make good first impressions and when distributing printed materials that are comb bound, imprinting your text or logo on the combs creates an aesthetic and professional finishing touch. You can put almost anything you want on the spine of plastic combs in nearly any color. Imprinting on plastic binding combs can be done with ink or it can be foil stamped for a more shiny, metallic look. The process does have a minimum of 1000 pieces – you can mix sizes (in multiples of 100) to reach that number and it’s more affordable than you may think. 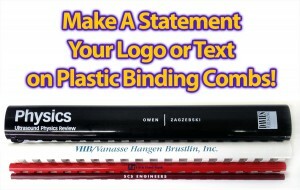 Got questions on imprinting plastic combs? Just ask in the comments below or contact CFS – we have answers! ← Are 4-Prong Velo Binding Strips Copatible With 11-Prong Machines?